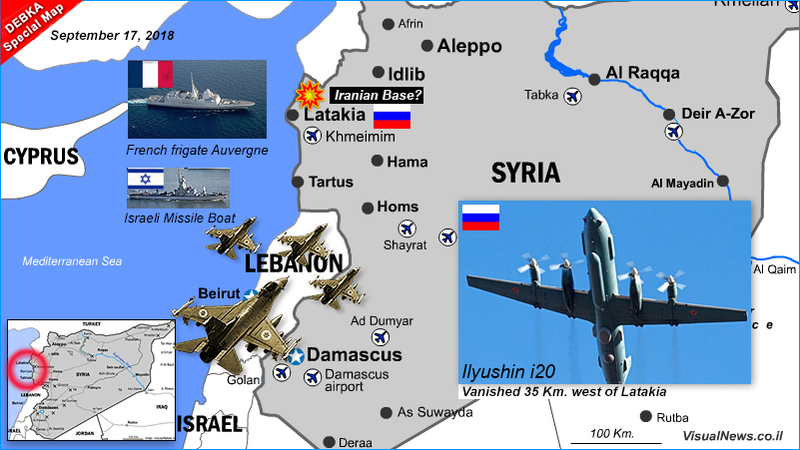 Russia blames Israeli military planes for creating a “dangerous” situation in Latakia, by exposing its missing IL-20 spy plane to friendly Syrian missile fire that was directed against an Israeli air raid nearby on Sept. 17. Moscow reserves the right to take appropriate measures. The defense ministry in Moscow said in an angry statement that Israel gave Russia one minute’s warning of the planned operation, not long enough to get the Russian military plane to safety. In a harsh telephone call on Tuesday, Sept. 18, Defense Minister Sergei Shoigu told his Israeli counterpart, Avigdor Lieberman, that 15 Russian military service people had died because of Israel’s “irresponsible actions.” The MoD accused Israeli jets attacking targets in the area of “using the Russian plane as cover, exposing it to fire from Syrian air defenses.” The plane disappeared from radar 35km from the Syrian coast Sunday night as it was returning to the Russian Khmeimim air base in Latakia. Israel has not commented on this extremely serious accusation. French military spokesman Col. Patrik Steiger denied any involvement, after the Russian spokesman referred to the French frigate Auvergne as firing missiles at the Syrian Latakia coast at the same time as the reported Israeli air raid. DEBKAfile: After assigning responsibility for the loss of a valuable, high-tech spy plane and 15 military personnel to the Israeli air force, it is up to President Vladimir Putin to determine how to respond and what measures are appropriate. Israel will not get away with disputing the Russian MoD’s findings, or a personal apology by Prime Minister Binyamin Netanyahu to the Russian president, with whom relations are normally friendly. Putin is obliged to satisfy his army and air force with a response commensurate with the gravity of the incident and the seriousness of their loss. Will he limit that response to the bilateral dimension of Russian-Israeli relations, or take it further and direct Russian fury at the US military presence in Syria? Wider connotations of the episode were implied in the defense ministry’s reference to the French Auvergne as firing missiles at Latakia from the sea, although, according to DEBKAfile’s sources, the French denial was correct. The sea-to-shore missiles were in fact fired by an Israeli missile ship. This incident occurred exactly 45 years to the day after the Soviet Union gave Egypt and Syria a green light for their armies to attack Israel and so launch the 1973 Yom Kippur War.